The Award Winning UMass Dining offers a wide variety of world cuisine with a mission to put students first. 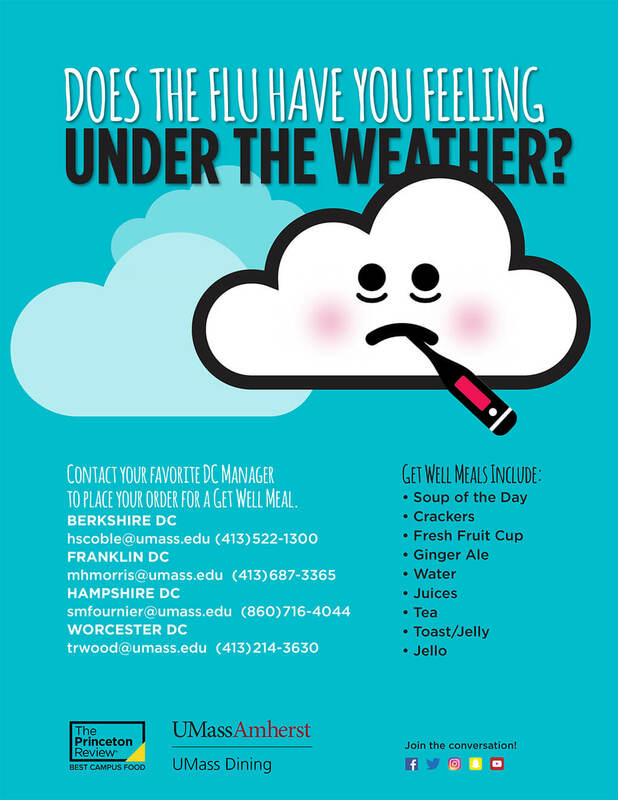 In lieu of Mom’s chicken soup, UMass Dining offers Get Well Meals to students who are unable to dine due to an illness. The wellness meals include comfort items and are packaged for pick up. Meals can be customized on a case by case basis. Our goal is to offer comfort to the student while s/he recovers from an illness. If students have any questions or concerns regarding the ingredients or nutritionals of the Get Well Meals, please contact Heather Scoble at 413.522.1300. • Eat fresh vegetables and fruits, which contain phytochemicals that help give the vitamins in food a magnified effect. • Avoid mucous-forming foods. Large amounts of dairy products can be a problem for some people. • Excess amounts of sugar and alcohol can impair the immune system. • Drink plenty of fluids. Avoid caffeinated beverages such as coffee, tea and soda because caffeine acts as a diuretic. Drink decaffeinated herbal teas, poultry or vegetable broths. • Consuming foods high in Vitamin C and zinc have been shown to boost the immune system. • Use good personal hygeine. Wash your hands! You do not know who touched that door knob before you. • Use a tissue when you sneeze or cough. Do not sneeze or cough into your hands so germs are not transmitted. • Do not touch your face. You are increasing the risk of transmitting viruses entering through your eyes, nose or mouth. • Take a hot shower to help moisten the mucous of your respiratory system. • Get fresh air. Winter heating dries you out and makes you more susceptible to viruses. Germs tend to circulate indoors. • Stop smoking. Smoking can affect the immune system and dry out your nasal passages. • Get plenty of rest and sleep. • Relax! By relaxing more often, you can teach your immune system to work better when needed.